“We wanted to help several ongoing efforts to make the northwest region a gateway to the country,” says Lori Tubbs, president of Commercial Advantage and the public awareness chair for the Northwest Council. Pictured is Tubbs at Port of Indiana where Commercial Advantage leases warehouse space. Indiana designated “Crossroads of America” as the official state motto in 1937. The slogan began as a nickname for Indianapolis because it’s the hub for several interstate highways that crisscross the state. Those highways connect Hoosiers to the rest of the country. Ten years ago, state leaders initiated research to determine best practices for attracting new and expanding business to Indiana. The results have created a synergistic team that is making Indiana the Crossroads of America again. Conexus Indiana was established in 2008 as an organization that focuses on advanced logistics and infrastructure throughout the state. In 2015, Conexus’ Northwest Regional Logistics Council published a report on how to advance Northwest Indiana’s logistics. “We wanted to help several ongoing efforts to make the northwest region a gateway to the country,” says Lori Tubbs, president of Commercial Advantage and the public awareness chair for the Northwest Council. 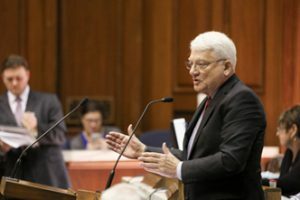 State House Representative Ed Soliday (R-4th) authored HB 1002 to finance transportation infrastructure roadwork, something that he says is critical to the bill’s success. State House Representative Ed Soliday (R-4th) authored HB 1002 to finance transportation infrastructure throughout the state. The bill is the cumulative result of studies that Soliday began in 2011 and a model his team created in 2013. Because of HB 1002, several road projects are underway to benefit Northwest Indiana. One will transform U.S. 30 into an interstate-like highway with limited access from Valparaiso to the Ohio state line. Another will address railroad crossings in Lake County by building overpasses to alleviate congestion. The efforts to make U.S. 31 a freeway from Indianapolis to South Bend are nearing completion, also a result of HB 1002. 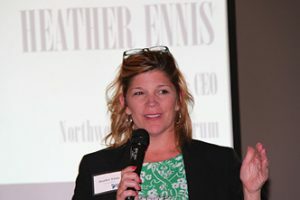 “We partner with Conexus and the Indiana Economic Development Corporation to help attract and retain businesses in Northwest Indiana,” says NWI Forum President and CEO Heather Ennis. The Northwest Indiana Forum is launching a new marketing campaign touting the Region with the slogan “Welcome to the middle of everywhere”. They’re also launching a five-year economic development plan for the seven-county Northwest Indiana region. They will put together an expansive plan that will collect input from economic development agencies, local governments, big businesses, and residents, then outline action items that can be taken. The Indiana Harbor Belt Railroad is a classic example of Indiana’s crossroads capability. From O’Hare airport to the Port of Indiana, the IHB connects to industries and railroads all along the Lake Michigan curve. A phone call comes in. A company is looking to move to Northwest Indiana in the next 18-24 months. They need 100 employees with skillsets ranging from computer technology to CNC programming to warehouse distribution. 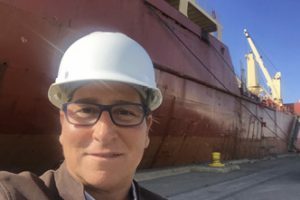 The Port of Indiana-Burns Harbor is in line to receive a $9.85 million federal grant that would help bulk up its infrastructure to handle multimodal containers that can be loaded onto ships, barges, trucks or trains. The U.S. Department of Transportation is recommending partial federal funding for a $19.7 million expansion that also will boost the port’s cargo handling capacity. The Indianapolis-based Ports of Indiana, a quasi-government agency that’s managed like an independent business, would fund the other half of the cost. The planned expansion would include a new 2.3-acre cargo terminal for transfers of multimodal containers, 4.4 miles of rail, and two new rail yards that could store 165 rail cars, accommodate a 90-car train and switch trains onto other tracks. Other projects would include the addition of 1,200 feet of usable dock space, a new 6-acre truck marshaling yard, the extension of a retaining wall on the west dock, and the repaving of a dock apron. The accomplishments to date of Conexus, the NWI Forum, the state government, and the Center for Workforce Innovation are impressive. What’s on the horizon? The Crossroads of America is more than a slogan. It’s a vision of logistics and infrastructure creating a thriving business environment for manufacturing, warehousing, distribution, and technology. It creates a state that works for all, employers and employees alike.